This airticle is aboot the ceety. For the destrict, see Thiruvananthapuram destrict. For the urban agglomeration aurie o Thiruvananthapuram, see Thiruvananthapuram metropolitan aurie. 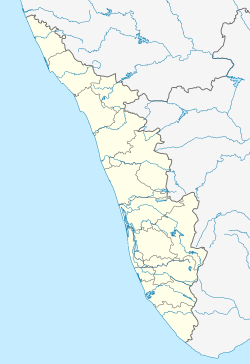 Thiruvananthapuram (IPA: [t̪iruʋənɨn̪t̪əpurəm] ( listen)) kent in Inglis as Trivandrum /trᵻˈvændrəm/, is the caipital o the Indie state o Kerala an the heidquairters o the Thiruvananthapuram destrict. It is locatit on the wast coast o Indie near the extreme sooth o the mainland. Referred tae bi Mahatma Gandhi as the "Ivergreen ceety o Indie", the ceety is characterisit bi its undulatin terrain o law coastal hills an busy commercial alleys. The ceety haes a population o mair than 750,000 inhabitants an a population o aroond 1.68 million in the urban agglomeration, Thiruvananthapuram is the lairgest an maist populous ceety in Kerala. It is an IT hub o the state wi ower 80% o the state's software exports. ↑ "Trivandrum India". Destination 360. Retrieved 2010-06-18. ↑ The Indian encyclopaedia: biographical, historical, religious, administrative, ethnological, commercial and scientific. Archery-Banog, Volume 2. Genesis Publishing Pvt Ltd,. 2002. p. Page 7063. ↑ "India: metropolitan areas". World Gazetteer. Archived frae the oreeginal on 2010-02-28. Retrieved 2010-03-10. ↑ "Exports from companies in Technopark: Chapter 21, page:502, section:21.8" (PDF). Information And Communication Technology. Planning Board, Government of Kerala. 2009-12-01. Retrieved 2010-10-22. ↑ "Thiruvananthapuram ranked as 4th IT destination in India (page 4)". India's hottest IT destinations. Rediff. Retrieved 2010-10-22. ↑ "Exports from companies in Technopark: Chapter 21, page:220, section:21.66" (PDF). Information And Communication Technology. Planning Board, Government of Kerala. 2010-12-01. Retrieved 2011-02-28. This page wis last eeditit on 11 Mairch 2018, at 02:48.